Nigun (ni-gun): n., plural: nigunim, a song of the Kabbalistic/Chassidic tradition, generally without words. Considered a path to higher consciousness and transformation of being. ● “If words are the pen of the heart,” taught Rabbi Schneur Zalman of Liadi, “then song is the pen of the soul.” The soul’s pen, however, writes in the opposite direction from the heart’s. While words carry meaning downwards from G‑d’s own primal consciousness into the minds of sages and the lips of prophets to inscribe them upon human hearts, song carries the soul upwards to be absorbed within the Infinite Light. That is why nigunim generally have no words. Words limit and define, but the nigun tears the soul beyond all bounds. Beyond words. ● A tzaddik (“righteous person”) is one who has mastered the animal inside and achieved a higher state of being. In a nigun, a tzaddik encodes his soul. When we sing a nigun of a tzaddik, we connect with the innermost garments of the tzaddik’s soul, and from there come to union with the light that tzaddik has found. That is why each note and nuance of a nigun must be precise. As the words of a sacred text, they must be learnt and repeated in perfect form. Because the tzaddik’s mind and soul are held within them. That is why a nigun must never be rushed. The pace, the silence, the mindfulness—all must be preserved in order that the nigun reach deep inside. ● The holy rebbe Rabbi Yosef Yitzchak of Lubavitch taught: “A nigun opens windows in the soul.” First there must be deep contemplation, focusing the mind upon the oneness of the cosmos and its Creator, to see that unity within each thing until it becomes more real than even your sense of self. But the contemplation may remain frozen in the realm of cold intellect. With a nigun, what is held imprisoned deep in the soul pours down into the mind, and from the mind to the heart. Meditation may enlighten the intellect, but a nigun can uplift and transform all of your being. 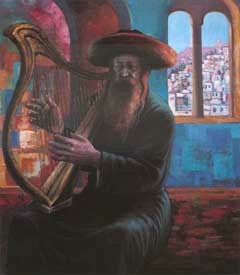 That is why the ancient prophets would sing and play musical instruments as they awaited the gift of prophecy. In this way they would strip themselves of the barriers of body and mind, opening themselves as channels of the Infinite Light. Not for the sake of transcendence alone, but to draw that transcendence down to earth, to awaken the hearts of humankind to the inner truths of life on earth. “A river went out from Eden to water the garden . . .” (Genesis 2:10): from the source of all delight, the river of life flows downward, branching outward to each world and every created being. Each thing thirsts to rejoin with its source above, and from that yearning comes its song, and with that song it comes alive. The heavens sing, the sun, the planets and the moon; each animal, each plant, each rock has its particular song, according to how it receives life. Until the entire cosmos pulsates with a symphony of countless angels and souls and animals and plants, and even every drop of water and molecule of air, singing the song that gives it life. That is why a nigun brings a surge of new life and healing, sweetens the bitter soul and fills a home with light—like the songs sung by David for King Saul, which healed his bitter spirit. ● A song is oneness. A song turns around upon itself in a circle of oneness, until there is no beginning or end. And as the Rebbe, Rabbi Menachem Mendel Schneerson, taught, a song unites those who sing and hear it: When words are spoken, we each hear the words according to our understanding. But in song, we are all united in a single pulse and a single melody. That is why it is said, “All the world will sing a new song,” in the messianic era coming very soon upon us—a song of the essential oneness expressed throughout our world. I see it repeated over and over on the internet, all without citation. In addition, would you please cite for "Rabbi Yosef Yitzchak of Lubavitch taught: 'A nigun opens windows in the soul.'" That we know of, he didn't compose. But there were Nigunim that he particularly liked and were sound often by his farbrengens. Thank you! Thank you Rabbi Freeman for your quick response. I was just wondering if you have that letter printed somewhere if it could be referenced or if it could e viewed online. I would love to see it! Re: Source (Zalman) Very sorry I did not provide sources. In more recent articles, we've been trying to source everything. Hi and thank you for your beautiful article! I wondered if you had sources for these - specifically I wondered if you could provide a source for the last one - the one from the Rebbe regarding oneness that is in song/singing. I would like to write this on our music school's cover sheets tomorrow and it would be proper to provide a source. music meditation Rabbi Freeman. As Always impressed with your article, question: do you play any music instruments your self? and I urge you to move closer to a Chabad and to sing nigunim with other Jews more often!